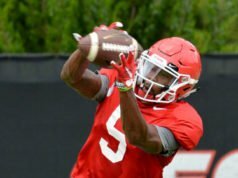 ATHENS—-University of Georgia head football coach Kirby Smart has added three to his on-field coaching staff. 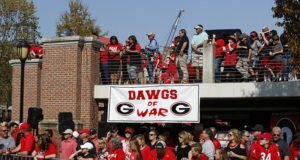 Pitt offensive coordinator and quarterbacks coach Jim Chaney and Arkansas offensive line coach Sam Pittman have been named to similar positions at UGA while Alabama Director of Player Development and Associate Director of Personnel Glen Schumann has been named to a defensive staff position. “Glen did an outstanding job in several areas during his eight years at Alabama and he’ll be a great addition to our staff,” said Smart. Chaney also spent three years in the NFL with the St. Louis Rams (2006-08) working with the offensive line for two seasons and the tight ends for one. Steven Jackson was a 1,000-yard rusher in each of Chaney’s three seasons in St. Louis. At Purdue, he coached quarterback Drew Brees, who later led the New Orleans Saints to a Super Bowl title. Brees led the nation in total offense in 2000 (358.1 yards per game) and was selected the winner of the prestigious Maxwell Award as the college player of the year. Pittman, who is universally considered one of the nation’s best offensive line coaches and recruiters, just completed his third season as associate head coach, recruiting coordinator and offensive line coach with the Razorbacks. In the last four seasons, a Pittman-coached offensive line has led the SEC in fewest sacks allowed—three years at Arkansas and one at Tennessee. Arkansas allowed only 1.00 sacks per game in 2015, 1.08 in 2014, and 0.67 in 2013. In 2012, Pittman coached the Tennessee offensive line that led the SEC with just 0.67 sacks allowed per game. Since 2013, eight offensive linemen coached by Pittman have been drafted, including two first-round picks. 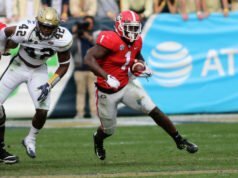 In 2015, Pittman’s Arkansas team finished second in the SEC in total offense (456.8 ypg), second in scoring offense (40.2 ppg), and third in passing offense (264.2 ypg). He previously served as offensive line coach at Tennessee (2012), Associate Head Coach and offensive line coach at North Carolina (2007-11), and offensive line coach at Northern Illinois (2003-06). Schumann was named to his position at Alabama in February, 2014, after spending six years with the Crimson Tide, first as an undergraduate analyst (2008-Dec. 2011) and then as a graduate assistant (Dec. 2011-Feb. 2014). In his role at Alabama, Schumann’s responsibilities have included off-the-field activities of Alabama’s football student-athletes serving as an important resource in balancing the demands of academics, athletics and community outreach. Chaney was an instrumental figure in Arkansas achieving its first winning campaign since 2011 during the 2014 season. The Razorbacks averaged 406 yards and 31.9 points per game, capping the season with a 31-7 rout of Texas in the Texas Bowl. Chaney’s offense produced two 1,000-yard rushers and a 2,000-yard passer. In 2013, Chaney’s offense featured underclassmen starters at quarterback, running back, tight end and two offensive line positions. Despite that youth, Arkansas averaged 5.28 yards per rush–the fourth highest season average in school history. Center Travis Swanson was a first team All-American, while running back Alex Collins was a 1,000-yard rusher and the SEC Freshman of the Year. Arkansas set a school record by surrendering only eight sacks. While at Tennessee, he also served as the Volunteers’ interim head coach for the 2012 season finale, a 37-17 win over Kentucky. That same year, UT quarterback Tyler Bray threw for 3,612 yards and 34 touchdowns, both career bests. Bray’s 530 passing yards against Troy broke Peyton Manning’s single-game school record and marked the second highest total in SEC history. The Volunteers ranked among the nation’s most productive offenses in 2012, finishing 15th in passing yards, 18th in total offense and 22nd in scoring. In 2012, Tennessee quarterback Tyler Bray passed for 3,619 yards and 34 touchdowns. At the time, his touchdowns were the seventh-most in a season in SEC history, and his passing yards ranked 11th in conference history. Bray also broke the Tennessee single-game record with 530 passing yards, a record previously held by Peyton Manning and the second-highest single-game total in SEC history. Of Pittman’s eight drafted offensive linemen in the last three years, Ja’Wuan James was selected 19th overall by the Miami Dolphins in 2014 and Travis Swanson became the highest Razorback center draft pick in school history when he was picked 76th overall by the Detroit Lions. In 2013, Jonathan Cooper, who was tutored by Pittman for four seasons at North Carolina, was the seventh overall pick to the Arizona Cardinals, the earliest an offensive guard had been taken since 1986. The 2014 campaign saw four Razorback underclassmen earn All-SEC honors. Guard Sebastian Tretola was named to the ESPN.com All-SEC team, tackle Dan Skipper and guard Denver Kirkland each earned All-SEC honorable mention recognition from the Associated Press and freshman center Frank Ragnow was named to the coaches’ SEC All-Freshman team. Ragnow was also selected as one of the best true freshman in the nation when he was named to the Sporting News All-True Freshman team. Arkansas led the conference and was sixth in the nation in 2014 allowing one sack every 37.63 pass attempts. The Razorback offensive line kept opponents out of the backfield all season, and finished first in the SEC and fourth in the NCAA with an average of 3.75 tackles for loss allowed per game. Pittman oversaw the offensive line in 2013 at Tennessee, when the Volunteers led the SEC and ranked fourth in the NCAA in fewest sacks allowed per game, following five seasons coaching the offensive line at North Carolina. Pittman played at Pittsburg State, where he was a first-team NAIA All-American and twice earned all-conference recognition. He graduated with a bachelor’s degree in 1986 and was inducted into the PSU Athletics Hall of Fame in 1998. He is married to his wife, Jamie. Schumann comes from a long line of coaches with his father Eric spending 20 in college football as a defensive coordinator after playing safety for Alabama in the mid-70s. His mother Sherry is the Athletics Director at Collin College in Collin Country, Texas, while his grandfather Jack Haskin was a coach on the first football team at Florida State and is a member of the FSU Hall of Fame.